Explore familiar scenes from the 1916 Rising, rendered here in vivid detail, breathing new life into our perceptions of this turbulent time. Déan iniúchadh ar eachtraí aitheanta ó Éirí Amach 1916, á dtaispeáint anseo go sonrach spleodrach, ag cur beochta arís sna léargais atá againn den tréimhse shuaite seo. This image depicts British soldiers inspecting a car on Mount Street Bridge following some of the worst fighting to take place during Easter week. Around noon on Wednesday of Easter Week 1916, British regiment the Sherwood Foresters marched down Northumberland Road, confronting the Volunteers in a bloody showdown. The fighting lasted until around 8pm of the same day, and despite large numbers of British casualties, the troops still advanced from 25 Northumberland Road, crossing the Mount Street Bridge and eventually clearing the last rebel position in the area at Clanwilliam House. Remember and reflect upon the events of Mount Street/Boland Mills with Easter Monday Synchronised Wreath-laying Ceremonies, and an exhibition: Virtual Worlds Collide; Carriglea Park, 1916, while nearby on Merrion Square families will be treated to live music, classic cars and circus entertainers with RTÉ Reflecting the Rising. Léiríonn an íomhá seo saighdiúirí Sasanacha ag scrúdú cairr ar Dhroichead Shráid an Mhóta i ndiaidh roinnt den trodaíocht is measa a tharla le linn sheachtain na Cásca. Thart ar mheán lae ar an gCéadaoin i rith Sheachtain na Cásca 1916, rinne reisimint Sasanach na Sherwood Foresters mórshiúl síos Bóthar Northumberland, ag troid na nÓglach agus doirteadh fuil an lá sin. Mhair an trodaíocht go dtí thart ar 8pm an lá sin, agus in ainneoin gur maraíodh líon mór de na Sasanaigh, chuaigh na trúpaí ar aghaidh ó 25 Bóthar Northumberland, ag dul trasna Dhroichead Shráid an Mhóta agus de réir a chéile glanadh an seasamh reibiliúnach deiridh sa cheantar ag Clanwilliam House. Cuimhnigh agus déan machnamh ar eachtraí Shráid an Mhóta/Mhuilte Uí Bheoláin le Searmanais Fleascleagain Chomhthrátha, agus an taispeántas: Virtual Worlds Collide; Carriglea Park, 1916, agus gar dó sin ar Chearnóg Mhuirfean gheobhaidh teaghlaigh blaiseadh de cheol beo, de charranna clasaiceacha agus de lucht siamsaíochta sorcais le RTÉ Reflecting the Rising. This image portrays surrendered rebel prisoners being moved from Richmond Barracks in the days after the Rising and marched to the Dublin docks for transport to Britain. Many were sent to British prisons but the majority were interned at Frongoch Prisoner of War Camp in Wales. There were 90 rebels sentenced to death after the Rising. Of those, 15 had their sentences fulfilled, facing execution between May 3 and 12 of 1916. After the rebellion ended, British authorities court-martialled 171 of the 3,226 rebels who were detained. They were all men with the exception of revolutionary nationalist, suffragette and socialist Constance Markievicz, who was spared the firing squad on account of her gender. Most of the prisoners interned abroad were sent back to Ireland in December 1916. The Easter Sunday Wreath-laying Ceremony at Glasnevin Cemetery will remember the lives of those involved in Easter 1916 while Proclaiming a Republic: The 1916 Rising offers the chance to learn more about the personalities involved. Situated near the spot this image was taken, Smithfield Fruit Market will transform back to its original Victorian style with RTÉ Reflecting the Rising during the Easter weekend. Léiríonn an íomhá seo príosúnaigh reibiliúnacha a ghéill á mbogadh ó Bheairic Richmond sna laethanta tar éis an Éirí Amach agus á máirseáil chuig dugaí Bhaile Átha Cliath le tabhairt go Sasana. Cuireadh go leor acu i bpríosúin Shasana ach rinneadh imtheorannú orthu ag Campa Príosúnach Cogaidh Frongoch sa Bhreatain Bheag. Daoradh 90 reibiliúnach chun báis tar éis an Éirí Amach. Astu sin, cuireadh a bpianbhreith i gcrích ar 15 dhuine acu, agus cuireadh chun báis iad idir an 3 Bealtaine agus an 12 Bealtaine 1916. Tar éis don éirí amach críochnú, chuir údaráis Shasana cúirt mhíleata ar 171 den 3,226 reibiliúnach a cuireadh faoi choimeád. B’fhir iad go léir cé is moite de náisiúnach réabhlóideach amháin, an sufraigéid agus an sóisialaí an Cuntas Markievicz, a tháinig slán ón scuad lámhaigh de bharr a hinscne. Cuireadh go leor de na príosúnaigh a ndearnadh imtheorannú orthu thar lear ar ais go hÉirinn i mí na Nollag 1916. Cuimhneofar ag an Searmanas Fleascleagain, Domhnach Cásca ag Reilig Ghlas Naíon ar na daoine a bhí páirteach in Éirí Amach 1916 agus gheofar deis le Proclaiming a Republic: The 1916 Rising tuilleadh a fháil amach faoi na daoine a bhí páirteach ann. Gar don íomhá inar tógadh an pictiúr seo, beidh Aonach Torthaí Mhargadh na Feirme ar ais ar an stíl Victeoiriach mar a bhí sé i dtús ama le RTÉ Reflecting the Rising i rith dheireadh seachtaine na Cásca. Sackville Street, now known as O’Connell Street, was one of the finest streets in Europe at the beginning of the 20th century. As the main concentration area for fighting during the Rising, the street was largely reduced to rubble by the end of the insurrection. 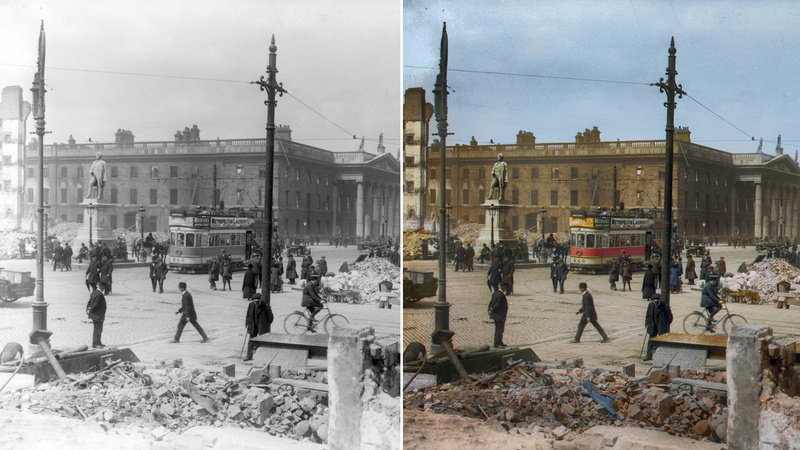 In the background of this image the General Post Office (GPO) is visible, which after two centuries continues to fulfil its duties as the headquarters for the Irish Post Service, An Post. However, during the Rising it took on a separate role as the rebels’ headquarters. It was from here the Republican flag was raised and the Proclamation of the Republic was read on Easter Monday 1916. Also evident in the image is Nelson’s Pillar, which, although thought to have been destroyed later in 1966 in an attack by the IRA, was in fact damaged by a small off-shoot of radical, left-leaning Republicans. Step back in time during the Easter weekend with a visit to the Easter Rising Centenary Visitor Centre at the GPO, the Easter Sunday Commemoration Ceremony and Parade (beginning at the GPO) and RTÉ 1916: Reflecting the Rising. Bhí Sráid Sackville, Sráid Uí Chonaill anois, ar cheann de na sráideanna ba bhreátha san Eoraip ag tús an 20ú haois. Bhí sí ar an bpríomhlimistéar i gcomhair trodaíochta i rith an Éirí Amach, agus ní raibh sa tsráid ach smionagar faoi dheireadh an éirí amach. I gcúlra na híomhá seo tá Ard-Oifig an Phoist le feiceáil, a leanann ag comhlíonadh a cuid dualgas tar éis dhá chéad bliain mar cheanncheathrú Sheirbhís Poist na hÉireann, an Post. Mar sin féin, i rith an Éirí Amach bhí ról ar leithligh ag an áit mar cheanncheathrú na reibiliúnach. Is as sin ar ardaíodh bratach na Poblachta agus ar léadh Forógra na Poblachta ar Luan Cásca 1916. Le feiceáil sa phictiúr freisin tá Colún Nelson, a ceapadh a scriosadh ina dhiaidh sin i 1966 in ionsaí a rinne an IRA, ach a ndearnadh damáiste dó i ndáiríre i mion-eachtra lámhaigh, a rinne Poblachtaigh radacacha, a raibh claonadh acu le polaitíocht na heite clé. Téigh siar go deireadh seachtaine na Cásca le cuairt ar Ionad Cuairteoirí Chomóradh Céad Bliain Éirí Amach na Cásca ag Ard-Oifig an Phoist, leis an Searmanas Cuimhneacháin ar Dhomhnach Cásca agus an Mórshiúl (Ag tosú ag Ard-Oifig an Phoist) agus RTÉ 1916: Reflecting the Rising. Photos courtesy of the National Library of Ireland.